NextThe Holy Crown of St. Stephen. I managed to recently catch the biopic First Man late in its release and I’m certainly glad that I did. Interestingly, First Man might not have blown me away in the way that it did, if not for the emotionally charged and intelligent script of Josh Singer and the steady guidance of director Damian Chazelle. It is by no means a definitive look at the cold war space race between the United States and the Soviet Union. But what it does give us is a fascinating glimpse of the space race and the sacrifice and danger that goes along with it. But more to the point it is a moving personal tale of Neil Armstrong’s journey from test pilot to astronaut and how he would become the first person to walk on the moon. Chazelle might be Hollywood’s man of the moment (and rightly so) with Whiplash and La La Land, both fine examples of his deft touch at filmmaking and storytelling. With First Man he enters unexplored territory by telling us a story about Neil Armstrong that millions of people around the world had no idea about. I’m not talking about Armstrong being the first person to set foot on the moon, but the behind the scenes look at his training at NASA and in particularly the gut wrenching sadness he apparently felt when his very young daughter died of cancer and how much it affected his life and the decision he made after her death. It certainly makes you wonder whether his dare-devil antics as a test pilot and later his journey as an astronaut was a way of coping with his grief? Of interesting, to me in relation to his sadness and grief, is whether Armstrong really took his daughter’s bracelet to the moon and cast it out into one of the moon’s craters as a poetic symbol of his love and healing. It would be truly something if Armstrong really did use the moon as a memorial site for his daughter. According to some NASA experts and historians, it’s unlikely but not entirely improbable that it didn’t happen. But with really no evidence to truly back it up, is it the stuff of Hollywood myth-making? 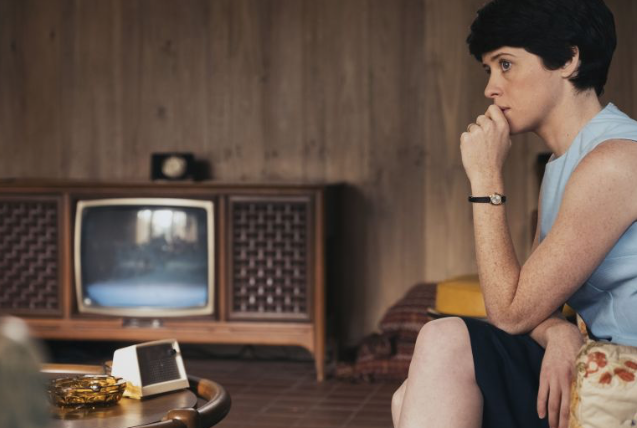 Everything it seems hangs in the balance with biopic films like First Man, especially when it comes to authenticity. First Man does its best to get the feel and look of the movie right, despite Chazelle’s poetic license to give his film emotional punch, especially towards the end of the film with the bracelet scene. But his abilities nonetheless to tap into other little known facts about Armstrong and in particular Armstrong’s stoicism is interesting and at times breathtaking. From the opening scenes where Armstrong almost drifts off into space in his experimental plane to the dinner table conversation, the night before the moon launch, where Armstrong is forced by his wife to talk to his boys, about the real possibility that he may never come back, is as real as it gets. Of course, not everyone is happy with this film, especially individuals like Donald Trump, who believes the glaring oversight of the planting of the American flag on the moon’s surface is “a terrible thing”. In truth, First Man is more than just about American patriotism, it’s a film that is really celebrating humankind’s greatest achievements. Finally, I cannot let you the reader escape without briefly touching on the acting performances of First Man. 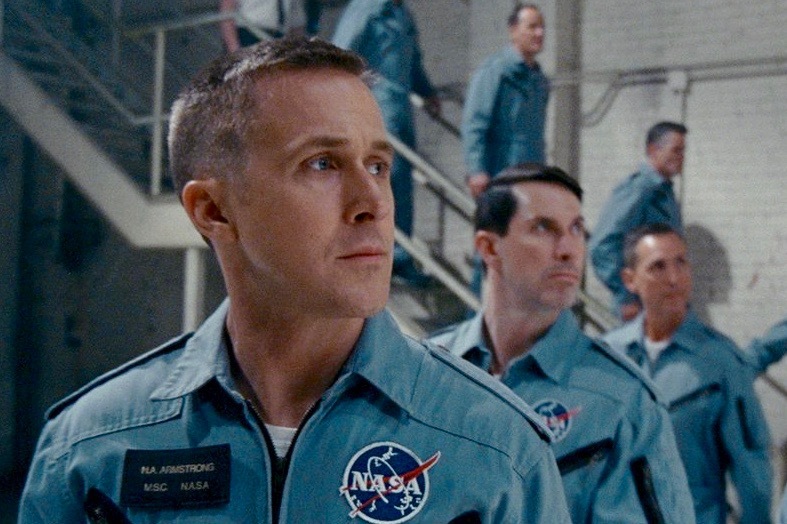 For me, there are really only two performances that count – Ryan Gosling as Neil Armstrong and Claire Foy as Janet Armstrong. Ryan Gosling, as the aloof but humble Armstrong, is brilliant. I’d be lying if I didn’t say that I expected to see more of a physical performance from Gosling. Of course, with most of the best scenes of the film carried out in the confined space of NASA capsules, it was always going to be a very different kind of performance that relied on the emotional intensity, even at times the lack of it, on Gosling’s face. And that there, I believe, is the genius of Gosling’s performance, not just in those action scenes, but elsewhere in the film, where he is trying to keep it together. Photo Credits: The movie stills from First Man used in this review are courtesy of Universal Pictures. I make use of the images under the rational of fair use, to enable me to makes an important contribution to the reader’s understanding of the article, which could not practically be communicated by words alone. That’s right Robert, Gosling’s and Foy’s performance is wonderful but I saw in the movie more than heroic story, it consisted some beautiful both sound and visual effects. I actually discussed about those points in my own review. Celebrating Christ: Where was Jesus born?